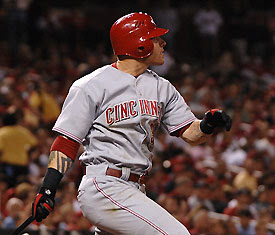 Raleigh, NC — Josh Hamilton (pictured) of the Cincinnati Reds will be a guest speaker at Hope Community Church (Mike Lee, pastor) during the weekend services of Saturday, December 1, at 5:30 p.m., and Sunday, December 2, at 9:00 and 11:00 a.m. The church, which is affiliated with the Fellowship of Grace Brethren Churches, is located at 821 Buck Jones Road in southwest Raleigh. Hamilton, also known as “Hammer,” hails from Raleigh and graduated from Athens Drive High School. In 1999, the Tampa Bay Devil Rays selected Hamilton first overall in the MLB draft making him the first #1 pick in franchise history. During the three weekend church services at Hope, Hamilton, nicknamed “The Natural,” will share his story of drug addiction and recovery, his rise to baseball fame, and how his faith impacted his addiction recovery and his baseball career. For directions to or more info regarding Hope Community Church, visit www.gethope.net or call 919.532.0620.